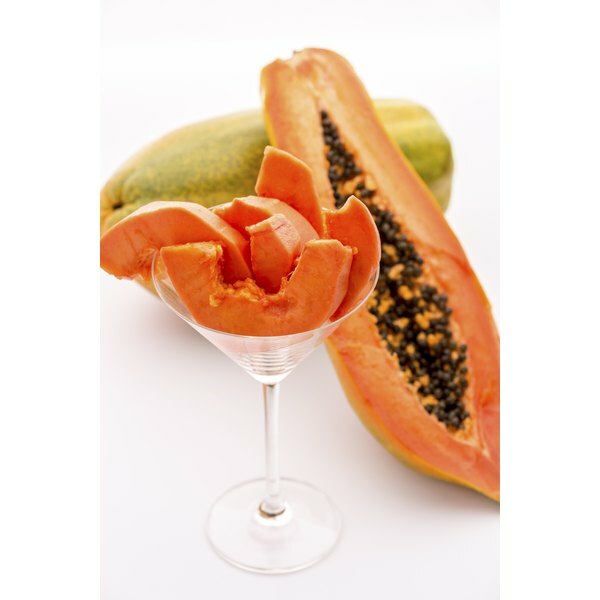 Papain is an enzyme found in papaya that can break down proteins, which is why it is sometimes used to tenderize meat. This enzyme may also be helpful for treating indigestion, according to an article published in the "Los Angeles Times" in September 2004. It is generally recognized as safe by the U.S. Food and Drug Administration, but it can cause some side effects when taken in supplement form. When used in food, papain is deactivated by cooking, so it isn't likely to cause side effects. Papain supplements, however, can cause irritation in your mouth and esophagus or digestive upset. Some people are allergic to papaya or papain. In this case, papain supplements may cause symptoms including itchiness, rash, hives, difficulty breathing and anaphylactic shock. Seek medical attention immediately if you experience these or other symptoms of an allergic reaction. People who are allergic to kiwi fruit or figs may be more likely to be allergic to papaya and papain. The small amounts of papain found in food aren't likely to cause problems with medications. However, the larger amounts found in supplements may cause problems if you're taking certain medications. Don't take papain supplements if you take blood-thinning medications, such as warfarin. Aspirin may also have a blood-thinning effect, so don't take it in combination with papain. Papain may interact with these medications, increasing their effects and making uncontrollable bleeding more likely. Women who are pregnant should avoid taking papain supplements because preliminary evidence from animal studies shows they may increase the risk of birth defects. Further research is necessary to determine whether there is a risk in humans as well, but it's better to be safe than sorry. People with bleeding disorders should also avoid papain due to its potential to thin the blood.